Starting at Osaka-jo Hall and continuing over six days, “X JAPAN WORLD TOUR 2017 WE ARE X Acoustic Special Miracle 6 DAYS” had its final performance on Monday, July 17, at Yokohama Arena. With even last-minute additional seats sold out, the number of audience members for the six-day event totaled 70,000. “I want to have a concert that will make history,” YOSHIKI said in a news conference before the first day of performances. 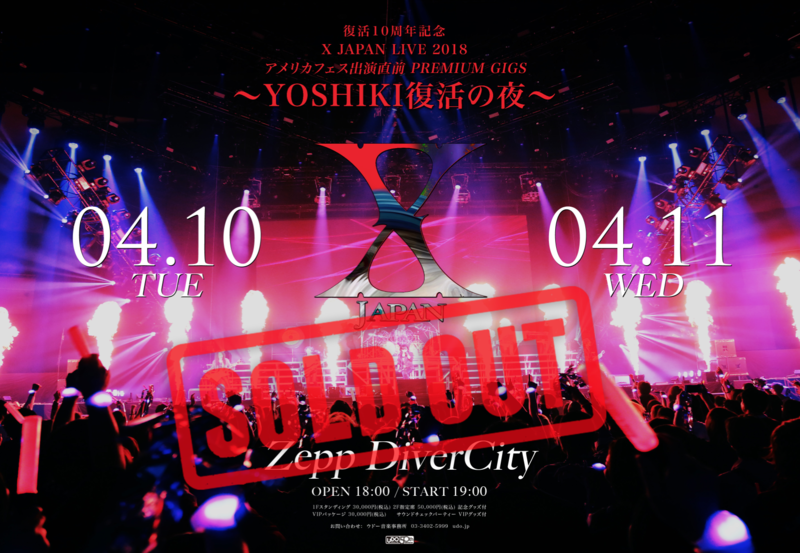 For X JAPAN, the band that has made the drums their weapon, and for YOSHIKI, who continues to do the unprecedented, this tour was historic in establishing “a new style”. 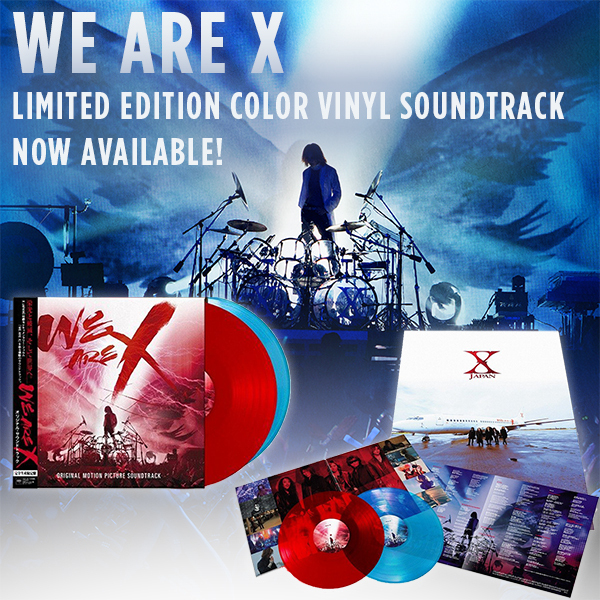 The We Are X Limited Edition Color Vinyl Soundtrack, released by Sony Music Japan International on December 13th, achieved #1 on Amazon's vinyl chart and soundtrack chart. The We Are X soundtrack album also accomplished the unprecedented feat of ranking No.1 on the British rock album charts. We Are X is the first vinyl album to be released from X JAPAN in 20 years, and the first vinyl record to be released on their old label Sony Music in 28 years (the previous time was with their major debut album BLUE BLOOD, released in 1989). The Japanese Blu-ray and DVD release of the award-winning X Japan documentary comes in three editions – the Collectors Edition, the Special Edition, and the Standard Edition. The Blu-ray Collectors Edition will include exclusive gold commemorative packaging able to be wall-mounted for decoration, available as both a 3-disc and 1-disc version. The 3-disc versions of the Special Edition and Collectors Edition feature original Japanese content, including Yoshiki's piano performance at the Sundance Film Festival and the Japan "We Are X: World Tour 2017" edition of the film. The Japanese releases also includes bonus footage, such as the songs "Kurenai" and "Forever Love", from "X Japan: The Last Live", held on December 31st, 1997, as well as unreleased footage and interviews with X Japan members not included in the theatrical release. In addition, the Special Edition also includes a 24-page photo book with rare images and liner notes. Each Japanese edition of We Are X includes a special "We Are X" trading card randomly selected from 7 different kinds -- Yoshiki, Toshi, Pata, Heath, Sugizo, Hide, and Taiji. Fans who purchase the Blu-ray/DVD at Amazon, Rakuten Books, Seven Net Shopping, TSUTAYA, TOWER RECORDS, and HMV will receive limited-edition "We Are X" metallic clear files while supplies last. 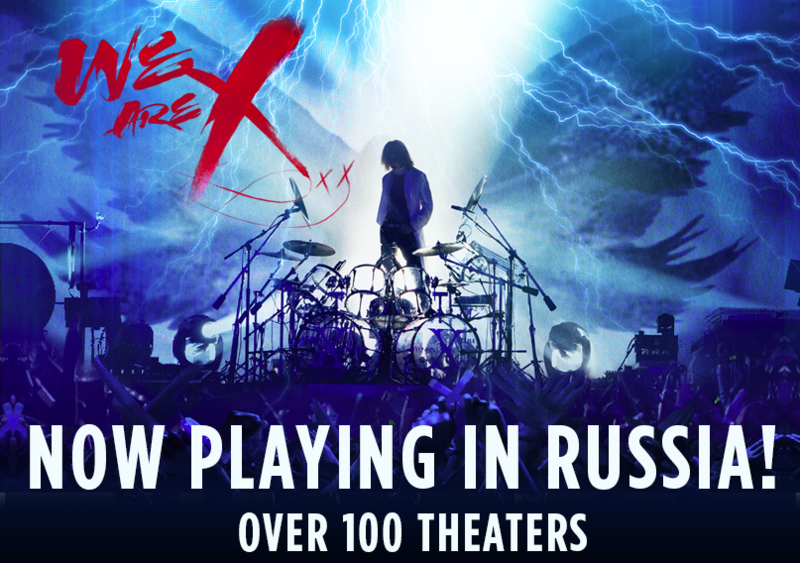 NEWS: X Japan'S Documentary FILM we are x now playing in Russia. Live Viewing Capacity Expanded - Limited Availability! WOWOW Special Live Broadcast 4/11! The screening will take place on Wednesday, April 18 at 7:30 pm in the GRAMMY Museum’s Clive Davis Theater followed by an intimate conversation with YOSHIKI. Tickets are limited and go on sale to GRAMMY Museum members and American Express cardholders starting Thursday, March 22 at 10:30am PDT with a general public on-sale starting Thursday, March 29 at 12:00pm PDT. NEWS: X JAPAN Live in Japan 2018 Three Deep Red Nights at Makuhari Messe Three-Day Event Announced! Largest X JAPAN Concert Since 2010! NEWS: Finally available internationally! X JAPAN's legendary "No Audience" Live Concert! 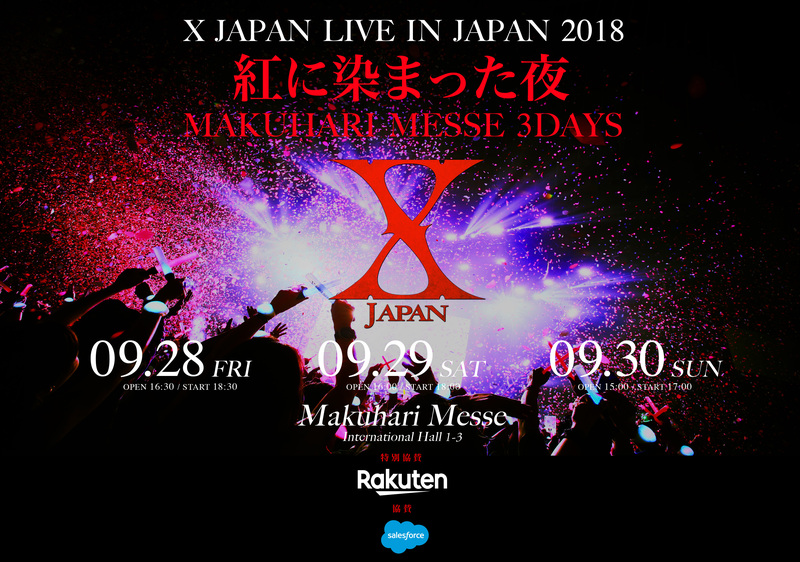 X JAPAN’s third-straight night of sold-out concerts for 100,000 fans — X JAPAN LIVE IN JAPAN 2018 — was suddenly cancelled on September 30, 2018, due to the impending weather effects of Typhoon Trami. With concern for the safety of fans as their top priority, X JAPAN announced that the band would perform an unprecedented large-scale “closed-door concert” with complete stage effects and crew which was broadcast to an audience of over 1 million viewers. Watch the legendary 9/30/2018 X JAPAN "No Audience" Concert! Now available worldwide! YOSHIKI will give special performances of "Anniversary" and "Endless Rain" with orchestra on NHK's "SONGS OF TOKYO" April 22, 2019, followed by an exclusive interview with host Shingo Murakami (Kanjani∞). YOSHIKI will discuss his personal and musical challenges since making his major debut 30 years ago with X JAPAN in 1989, the first year of the Heisei era. This will be the first original full-size TV debut of "Anniversary", composed by YOSHIKI to commemorate the 10th anniversary of the Emperor's reign, which was first performed during a national ceremony held in the Imperial Palace Plaza in 1999.